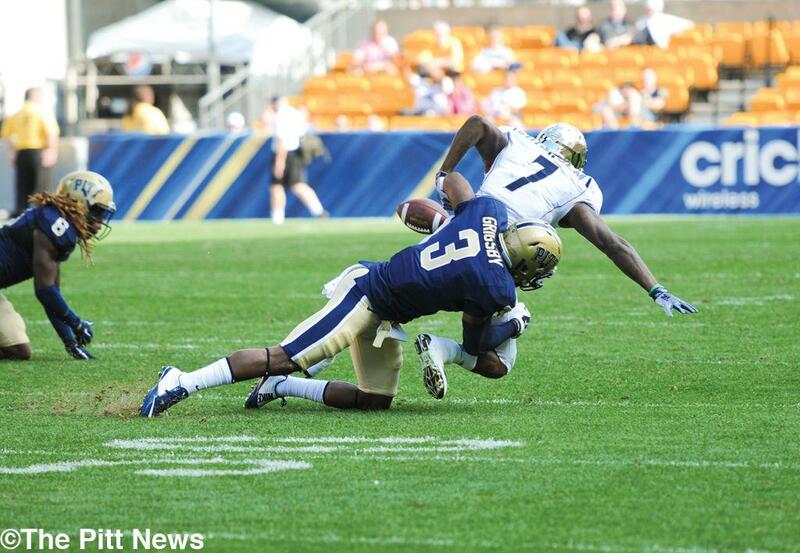 Three weeks ago, Pitt football secured its win over Boston College with a late interception. After safety Terrish Webb intercepted the pass, he began to run out of the end zone before hitting the ground to avoid an onrushing opponent. Teammate Ray Vinopal, a senior captain, then came over and, in an exchange picked up by an ESPN field-level microphone, asked the sophomore what he was doing. It was a good question, because up 10 points with 13 seconds left, there was no reason to go anywhere but down. Webb had had a mental lapse. Following Saturday’s baffling display against Akron, which ended 21-10 in favor of the Zips, it’s fair to ask the Panthers the same question regarding their nightmarish performance. Pitt (3-2, 1-0 ACC) never looked better than its lesser opposition from the MAC and never appeared to play with an urgency appropriate to the disparity in points. Head coach Paul Chryst said after the game that Akron didn’t surprise his team. “There wasn’t much that they showed us that we hadn’t prepared for,” Chryst said. But after failing against a team that lost its previous two games by an average of 24.5 points, the question still remains and, perhaps, becomes more intriguing. What were the Panthers doing? Sophomore running back James Conner ran fewer than 100 yards for the first time this season. Quarterback Chad Voytik threw two interceptions, the second of which resulted in a touchdown before its nullification due to an offsides penalty. “Offensively, we were stagnant,” Chryst said. More important were the seven penalties, for a combined 55 yards. “I thought we’d play cleaner,” Chryst said. Part of playing cleaner is avoiding penalties. Pitt didn’t do that. The most glaring example was a 10-yard holding call on left guard Dorian Johnson. The hold erased a Voytik touchdown to Tyler Boyd in the third quarter, with Pitt down seven. However, Chris Blewitt made a 34-yard field goal to salvage something positive from the drive. But the momentum firmly remained with the Zips until the final whistle, whose only win before this weekend came against Howard, a 1-4 Football Subdivision team. Before that, with the second quarter coming to a close, an offside penalty by junior defensive tackle Darryl Render turned a third-and-nine into a third-and-four, which Akron converted. The mistake didn’t result in any points, but Akron drove to the Pitt 30-yard line before a David Durham sack pushed the offense out of field goal range. Infractions come down to discipline, something Pitt is unable to maintain for stretches. The penalty problem is nothing new. Coming into the week five matchup, Pitt tied for 55th among FBS schools in penalties per game with six, 77th in fewest total penalties with 24, 85th in fewest total penalty yards with 220 and 68th in fewest penalty yards per game with 55. After Akron, Pitt improved one spot in total penalty yards (275) and moved up to 63 in penalty yards per game (55). It could have gone the other way if not for an unsportsmanlike conduct flag on Shakir Soto in the fourth quarter that was offset, meaning no yards. Meanwhile, Pitt dropped seven spots to 62 in penalties per game (6.2) and dropped two spots to 79th in fewest total penalties (31). Pitt’s movement in these rankings comes while many of the other teams, both behind and ahead of Pitt, have only played four games to the Panthers’ five. With next Saturday’s game at Virginia marking the midpoint of the regular season, shouldn’t the group have addressed this issue by now? The other issues facing this team — of which there are many ­— deserve attention too, sure, but penalties are basic. Captains T.J. Clemmings, a redshirt senior, and Nicholas Grigsby, a redshirt junior, committed three of the penalties, totaling 25 yards. Vinopal, who had a first-quarter interception in the end zone that kept the visitors from taking an early lead, said the ongoing penalty problem comes down to a lack of discipline and focus. Saturday proved as much, and last week’s contest against Iowa did, too. Pitt had eight for 80 yards then —its most of the season. Redshirt senior Manasseh Garner has committed several of the infractions this year, which he acknowledged. What’s it going to take to improve in this area of play? If this team can’t figure out how to do so, the Panthers won’t be able to succeed.